The Kenmore 94172 electric range features an easy-to-use cooktop and a spacious oven for preparing hot, delicious meals. Four radiant elements provide cooking flexibility. The 9/6 in. dual element has outer and inner heating sources that concentrate heat into different pan sizes. A 12 in. element is ideal for large pots of boiling water. The ceramic glass surface wipes clean and provides a continuous cooking surface. 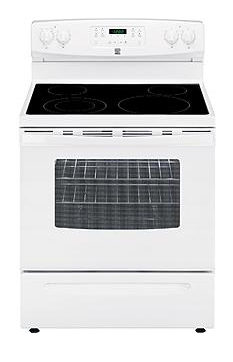 The white Kenmore 9417 freestanding electric range has a 5.3 cu. 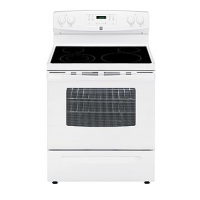 ft. oven that evenly cooks roasts, pies, casseroles and more. 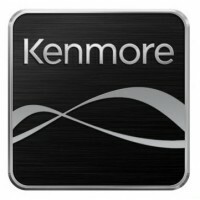 Variable self-cleaning lets you choose the right cleaning cycle from 2 to 4 hours. Monitor the dishes inside with the extra-large window and interior light. The oven is easy to control with an electronic control panel that lets you select oven options with the push of a button.